Changes to the Fair Labor Standards Act (FLSA) overtime rules could be around the corner. Labor Secretary Alexander Acosta and the Department of Labor (DOL) have made it clear those changes will focus on the salary threshold. The DOL issued a Request for Information (RFI) on overtime rules and exemptions. This RFI allows for the public to comment on the issues surrounding the white collar exemption. This includes salary threshold limits and how to set that threshold. Last year, the Obama administration narrowly missed enacting a new salary threshold when a Texas judge ordered an injunction to halt the final rule from taking effect at the end of 2016. Since the potential changes to the overtime rules focus on salary levels, we can expect changes to not affect the job duties exemptions. So, it’s important for employers and HR managers to know the ins and outs of the FLSA rules and the exemptions that go along with it—no matter what the salary threshold is. Though the FLSA offers certain entitlements to employees below the salary threshold, other rules may exempt an employee from FLSA coverage. The DOL reviews some guidelines around these job duties exemptions, but they can be difficult to understand. Unfortunately, if you don’t classify your employees the right way, you could be facing big penalties. Even if it seems difficult and tedious, FLSA status is something you want to get right. You'll save your company a lot of trouble in the long run. With that in mind, let’s take a look at the FLSA administrative exemption, and how to determine if your employees qualify. To determine which employees qualify for the administrative exemption, you need to understand the basics of FLSA status classification. The FLSA requires employers to pay employees at least federal minimum wage for hours worked, and overtime pay equal to time and a half for any hours worked over 40 hours in one workweek. Employees covered under the entitlements of the FLSA are considered nonexempt. Employees who are not covered to FLSA entitlements are considered exempt. 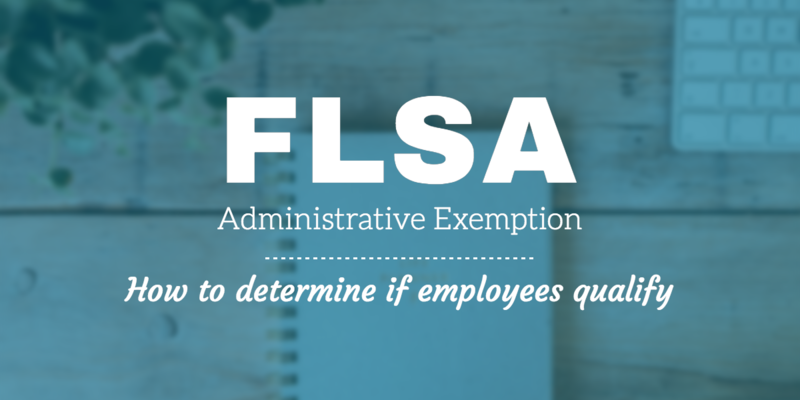 To determine if an employee’s FLSA status is exempt or nonexempt, use the FLSA exemption test. This test measures an employee’s salary basis, salary level, and duties performed. But, under the duties test comes some special cases that could make an employee’s FLSA status exempt, even if their salary basis and level match the nonexempt qualifications. The employee receives pay on a salary basis. The employee earns at least $23,600 per year or $455 per week. The employee performs exempt job duties. As always, if a state law differs from a federal law, the employer must always follow what law is most protective of the employee. After you’ve determined your employee's salary basis and annual salary, you need to take a look at the employee’s primary duties in his or her job. It’s important to note that these are the duties of the actual job, regardless of what’s listed in the job description. Employees with certain duties are considered exempt from FLSA coverage. This means they are not entitled to overtime pay for any hours worked over 40 in a single workweek. Support production or line employees that keep the business running without engaging in the production or sales of the actual product or service of the business. Now that we know the rules, let’s take a look at a couple of examples of the administrative exemption to help get a more thorough understanding. Jobs like Human Resources and Benefits Management fall under this administrative exemption. Their primary duties involve interpreting and implementing company policies or making decisions on behalf of the company that bind the company to significant purchases. Cornell Law’s Legal Information Institute gives a great example to show some subtle but important differences in job duties. In their example, they look two employees at a retail store: a comparison shopper and a store buyer. The comparison shopper looks at and reports a competitor’s prices to a store buyer. The store buyer then evaluates the report from the comparison shopper and sets the prices for the retail store. Which one performs job duties that qualify for the administrative exemption? The comparison shopper merely reports information back to the store buyer. This does not involve any interpretation or evaluation. However, the store buyer must evaluate the report and make decisions for the company based on that evaluation. The comparison shopper reports information. The store buyer exercises judgement based on that information. In most cases, the store buyer would qualify for the administrative exemption, and the comparison shopper would not. Employees who inspect, examine, or grade based on certain standards, rules, and skills acquired through specific training typically do not meet the job duties of the administrative exemption. Rather than using discretion or judgment, these employees use learned technical abilities to apply standards and procedures to their work. Does your company use a personnel clerk to screen job candidates for minimum requirements (such as fitness levels) for a role? This clerk probably doesn’t meet the duties for the administrative exemption. An HR or Hiring Manager may set those standards or make higher-level hiring decisions that require independent judgment. However, the task of screening requires only the recognition of specific minimum standards. Before you declare an employee exempt from FLSA entitlements like overtime pay, be sure you consider the primary job duties the worker performs each day. It will be a better use of your time to classify employees the right way now, rather than pay for a misclassification later. Read our Guide to FLSA Status and Overtime Rules to learn more about FLSA exemptions.